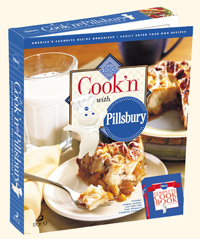 Pillsbury Recipes: Now enjoy Pillsbury Recipes On CD! I just got my new CD, Cook'n with Pillsbury and love it. I like not having to put the CD in every time I want to check a recipe. I love being able to add my own recipes. I have found more recipes that I use in this cookbook than I have in my other cookbooks. Thanks for always updating the cookbook. This was a great investment. Order today and receive a 10% Off All Orders of Cook'n! Pillsbury® recipes right at your fingertips. NOTE: The download contains the recipes ONLY. You must have Cook'n installed to use this download! The CD contains the Cook'n Recipe Browser. If you want to organize your own recipes you should purchase the Cook'n Recipe Organizer. The world of cooking is ever-changing, but one constant is a trusted name that is synonymous with cooking - Pillsbury. Now you can access the best Pillsbury recipes on America's favorite Recipe Software with the new Cook'n with Pillsbury CD. Known for "America's most trusted kitchens", Pillsbury has set the standard for cooking by offering high-quality recipes and food products for generations. Combined with the power of Cook'n software, you can now access all the Pillsbury recipes from Pillsbury's Complete Cookbook on your computer. Browse hundreds of mouth-watering food photos with the click of your mouse. And, learn valuable new preparation techniques with helpful video clips. Planning mealtime has never been easier! Loaded with over 1,000 Pillsbury recipes and 220 full-color photographs, this collection includes everything from appetizers and beverages to candies, cookies and desserts. 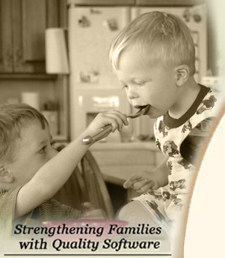 Using Cook'n with Pillsbury, you can plan a complete family-sized meal or whip up some delicious cookies for a treat. - MasterCook text file import! - Full installation option to run without the CD! - Improved, easy-to-use menus and buttons, and more! 1000+ recipes, photos, instructions, and more! • See the recipes that come on this CD. • Learn more about the features of the Cook'n engine. • Find out what people are saying about Cook'n. © 2012 DVO Enterprises, Inc. All rights reserved.